Often, it’s the unexpected things that end up to be so memorable. I felt that way about Budapest five months ago, and I felt that way last Friday night while watching tick, tick…BOOM! When I first saw 9 Works Theatrical’s teaser for tick, tick…BOOM!, I was intrigued by the mere fact that it was created by RENT‘s Jonathan Larson. RENT has always been one of my favorite musicals, and its soundtrack is one of those I revisit whenever I get ’em Broadway blues. When I learned about its basic story line, I became even more intrigued. A musical about the trials and tribulations of an artist who chooses between compromise or perseverance? How could I miss out on that? Thing is, I almost did. And I’m glad that I didn’t. I feel that all well-written musicals have the power to touch and move people, but tick, tick…BOOM! is one of those I could relate to without even trying. It’s actually an autobiographical story covering the period right before Jonathan Larson’s 30th birthday. Not only is Jon obsessing about the big 3-0, he’s also pressured by his childhood friend Michael, who wants Jon to join him in the corporate life, and his girlfriend Susan, who wants to move to the suburbs and start a family. The beginning alone, which explains the title, resonated all too well with me. That pressure of time ticking away while you feel you’re not moving, those sudden bursts of hopelessness when things just seem all wrong – how often have I worried about my future and felt like I was lagging behind my peers? And later, when he second-guesses his life decisions and wavers between pursuing his passion and giving it up for practicality and stability – do I still not ask myself which way to go? Can he make a mark if he gives up his spark? How can you soar when you’re nailed to the floor? I loved the concept of the musical. Jon’s monologues are narrative to the point that it seems like he’s directing each scene, which is so aligned with him being a playwright. 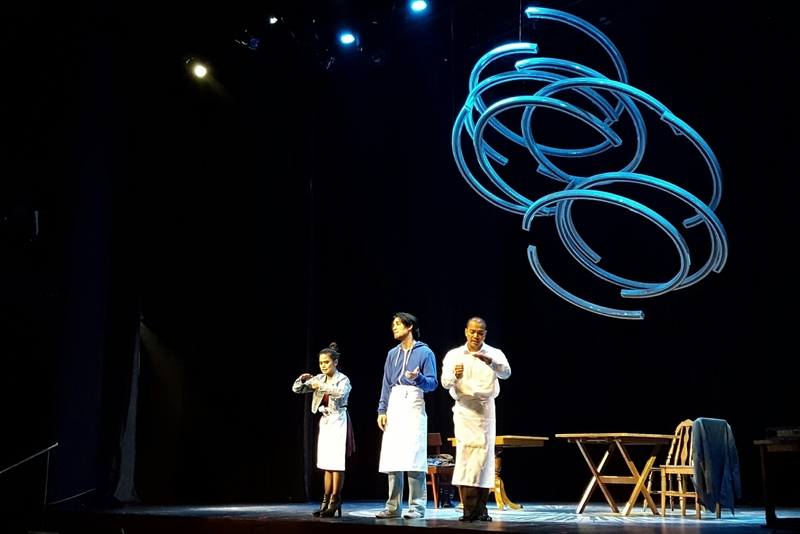 With only three actors on stage and minimal props, the focus was really on the performers and the words and music. The piece itself is stellar, with thought-provoking lines that ring with authenticity and lyrics that had me rushing to take notes. 9 Works built a solid, superb cast with Jef Flores (This is Our Youth) as main man Jon, Tanya Manalang (Miss Saigon) as Susan++, and Ariel Reonal (Miss Saigon) as Michael++. I say ++ because both Tanya and Ariel perform multiple characters including Jon’s dad, agent, and leading lady, as well as random waiters and office workers, among others. It was my first time to watch all three of them perform, and they made a lasting impression. Even my friend said that this was her favorite casting of all 9 Works’ shows. Jef really brought Jon and his anxieties to life. Despite being present onstage the entire 90 minutes of the show, Jef sustained his energy all throughout and had me a bit teary-eyed by the time he sang his gripping solo, “Why.” Tanya and Ariel were his perfect companions onstage, both of them switching characters and nailing their many entrances like those were second nature. I enjoyed how Tanya more than held her own as the only female in the cast. Her voice was so clear and powerful, and she captured my attention whenever she sang. Ariel, on the other hand, showcased his talent and experience particularly when his microphone failed and he had to project his voice to his co-actors’ mics. 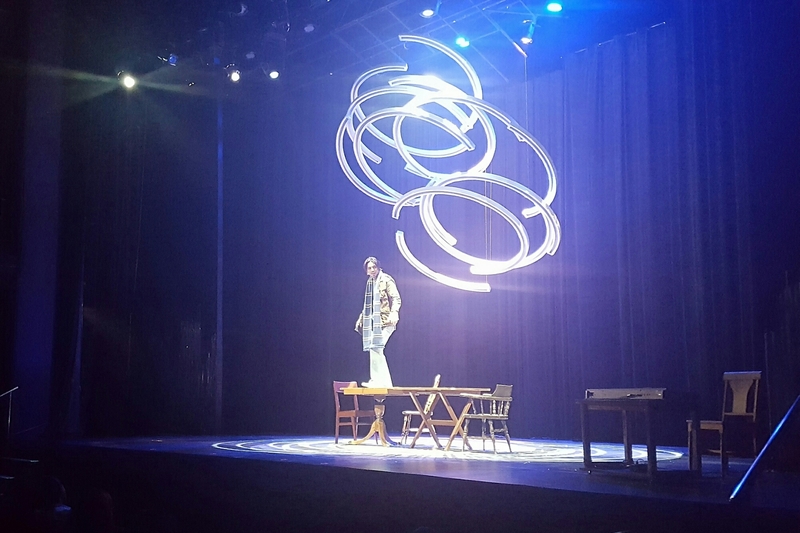 As with their production of The Last Five Years, 9 Works Theatrical maximized the limited stage area with multipurpose furniture, turning dining chairs into car seats and enhancing the visual with sound effects. It was a dynamic set, with the actors rearranging the props while in character – and it worked! Props to the cast and crew for synchronizing the blocking and movements with the lights and sounds. tick, tick, BOOM! is definitely one musical to watch. Not only is its theme relatable and relevant today, it’s well-produced, period. I’d love to watch it again, if only to capture meaningful lines I might’ve missed and see Jef, Tanya, and Ariel sing their hearts out a second time. Go catch it before it’s too late! tick, tick…BOOM! will have a limited run on October 8, 9, 15, 16, 21, 22 & 23, 2016 at 8:00pm on Fridays and Saturday, and 3:30pm on Sundays. For further inquiries, contact 586.7105, 0917.554.5560, Ticketworld at 891.9999, or email info@9workstheatrical.com. Previous PostAsia Young Designer Award 2016: Be Bold. Be Free. Be You.